A database (VetBact/VetBakt) with information about bacteria of veterinary interest has been developed at the Div. of Bacteriology (Dept. of Biomedical Sciences and Veterinary Public Health [BVF], Swedish Univ. of Agricultural Sciences [SLU], Uppsala, Sweden) as well as the Dept. of Bacteriology and the Office of Science and Quality (National Veterinary Institute [SVA], Uppsala, Sweden). The first version of the database was released to Internet on February 9, 2006 and in connection with a major update, VetBakt 1.0 got a special website on April 16, 2007. 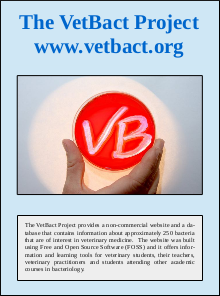 On March 19, 2010, the bilingual version of VetBact/VetBakt 2.0 was released at a new website (www.vetbact.org). VetBact is primarely intended to be a tool for veterinary students and their teachers, but can also be useful for veterinary practitioners and students attending other academic courses in bacteriology. Links to course material (video lectures, quizzes, virtual laboratory) have been collected on this page. Idea and coordination: Professor Emeritus Karl-Erik Johansson (BVF, SLU). Veterinary expertise: VMD Ingrid Hansson (BVF, SLU). Web developer, Webmaster etc: Dr. Staffan Tamm. Don't hesitate to contact us if you have any suggestions for how we can make this site more accessible. We use so called "sessions" (PHP Sessions) to carry information between pages, for example search information and language settings.A 'session id' may be stored in a temporary cookie depending on your browser settings. We do not use the cookies to track individual users or visits. During 2006 to 2009, these people contibuted information and suggestions. During 2010 to 2012, these people contibuted information and/or pictures. Financial support to develop VetBact has been obtained from the Faculty of Veterinary Medicine and Animal Science (SLU) and from BVF. The Swedish University of Agricultural Sciences (SLU), the National Veterinary Institute (SVA) and the Thure F & Karin Forsberg Foundation supported our work in 2011, and also in 2011-2012.